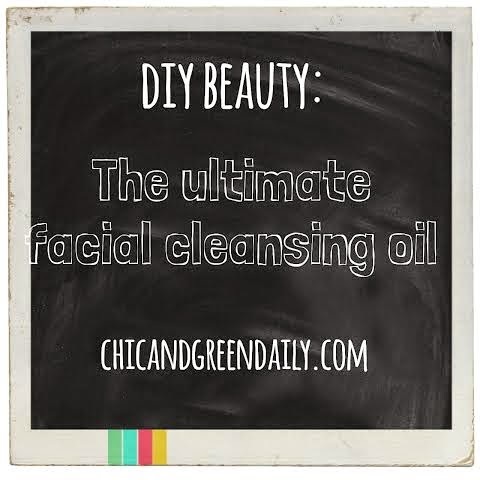 Today, I am going to show you how to make my facial cleansing oil. This was my best-selling cleanser for a good couple years and I know you'll enjoy it! If you are newer to Chic & Green, you may not know that I used to formulate skin care products. My handmade facial care line was open until September 2009, when I stepped away to enjoy more time with my boys. KZM Facial Care Boutique products were featured in Martha Stewart Whole Living (Body + Soul) magazine, multiple newspaper articles, and they made an appearance at the Blue Planet Film Festival. We've all seen the facial oils on the market from brands like Shu Uemera, DHC, and more. The only thing I believe setting this recipe apart from others is the cost. In fact, I believe this is less irritating because I do not use emulsifiers in this. No, this cleansing oil doesn't rinse right off with a splash of water, but that is not a bad thing. 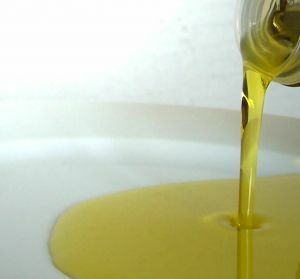 Sometimes people mistakenly believe that the OIL is what can aggravate breakouts in retail cleansing oils, when indeed it is the synthetic emulsifying agent. The emulsifying agents used in some of the popular retail cleansing oils have been shown to promote acne and aggravate eczema. This facial oil is what I use to remove my makeup at night as part of "double cleansing"--using a cleansing oil first followed by a second cleanser. Do not be afraid of the word "oil". Most vegetable oils do not, in fact, clog the pores. My facial cleansing oil is a wonderful blend of high-quality ingredients. You may use this to remove your makeup. It will melt it right off. I prefer to gently dampen the skin and then massage into my skin and wherever I have makeup. I rinse with tepid water and then follow with Exuviance Gentle Cleansing Creme. The Oil Cleansing Method has been embraced by several well-known brands. Why? It is gentle, yet effective! Here are the oils I put in this FACIAL CLEANSING OIL. You do not need all of them. You may use just one, two, three--all of them are just a FABULOUS blend! I use equal parts safflower & rice bran to make the bottle half way full. Then mix equal parts olive squalane, jojoba, sunflower, grape seed and argan to the mix to make up the other half. This is my personal best formula. Some people may want more grape seed...others more jojoba. It just takes a little experimentation to get the right blend for yourself. I make this without essential oils. I used to use them more in skin care, but I prefer not to most days now. To purchase the oils for this DIY, check out Mountain Rose Herbs. Their quality is outstanding. Safflower Oil: Safflower oil has firming and hydrating properties and consists of over 75% Linoleic Acid and is very high in Oleic Acid. Both are very moisturizing, yet this oil penetrates the skin very quickly so it isn't greasy. Rice Bran Oil: This wonderful oil can held reduce inflammation and skin irritation. It absorbs very quickly without leaving a film on the skin. This oil is antioxidant-rich, as it contains vitamin E and gammaoryzanol. Rice Bran is a great, lightweight oil to give your skin a velvety feel. Olive Squalane: Has been shown to reduce the appearance of wrinkles and fine lines. It is ideal to soften your skin as well. We naturally produce squalane, but as we age, the production slows down. This ingredient is vegan (traditional forms come from sharks), from olive oil. It can improve cracked skin, and skin suffering from conditions such as eczema and dermatitis. It has regenerative properties and can help restore a youthful, supple appearance. It is very light in texture, so it will not leave a greasy residue on the skin. Jojoba Oil: is wonderful for the skin because it mimics your skins own sebum, drawing excess oil out. Jojoba oil is pure and it is natural. This oil is hydrating without being greasy. It will not promote acne or aggravate an existing case of acne. Sunflower Oil: is chock full of vitamins A, C, D, and E. It is highly protective. It has also been shown to fight bacteria, which makes this a wonderful oil for acne, and why I believe this is ideal for all skin types. Grape Seed Oil: This is very lightweight and absorbs quickly into the skin. It contains antioxidants and has high amounts of linoleic acid. Argan Oil: Argan is a very special oil. Argan itself contains more antioxidant and cell regenerative properties than olive oil, grape seed oil and avocado oil combined together. Argan oil has been shown in many studies to help increase cell regeneration and improve cell turnover. When applied to the skin, it absorbs quickly, and without an oily film, leaving behind a silky and satiny feel. Argan Oil contains Omega 6 fatty acids, twice the amount of Vitamin E than olive oil, Vitamin A to improve elasticity; Phenols, which are tremendously beneficial antioxidants, as well as anti-fungal and antibacterial agents; and something called Triterpens, which aid in cell restructuring, can slow down the cell aging process, and also act as an anti-inflammatory. It is one of the more expensive oils to buy, but it is commonly referred to as "Liquid Gold" for a very good reason! How To Use Facial Cleansing Oil: Dampen skin with tepid water. Apply cleansing oil to your fingertips (no larger than the size of a dime) and massage into the skin. Massage for at least 60 seconds in upward circular motions. This oil is able to remove stubborn waterproof makeup, sunscreen and mascara. Gently massage and rub ever so gently with a gentle microfiber facial cloth like the Makeup Eraser. Rinse again. Follow with your favorite gentle cleanser.